I use this as an everyday day time cream. It's light so I wear it under my makeup. I haven't noticed a dramatic difference in skin tone, but my scars are definitely less noticeable. I love this face cream!!! Ambi is the BEST for dark spots and for those w dry skin! My face is always moisturized and takes the redness away on my skin! Within 2 weeks I started to notice my acne scars were fading. I applied the product twice a day to my face first thing in the morning and at night. Would recommend for its price. I have been using Ambi since I was in high school and it was been a constant in my skin care regimen.I absolutely love the ambi line. I use it every morning.It doesn't have a strong smell; it's barely noticeable. I use the normal to dry version in the winter and the oily version in the summer. It applies well and absorbs nicely and doesn't leave your skin feeling greasy. It does brighten your skin and gives you a youthful appearance. I get complimented all the time of how beautiful my skin is, I attribute it greatly to this product. It's very affordable and is great addition to your skin care routine. Highly recommended it especially if you are a woman of color. I have used this product off and on for a while now. It definitely makes my skin feel softer and smoother. It does seem to fade some of the acne scars on my face, it hasn't made them go completely away but I didn't expect it to. I mostly like the way it makes my face feel. It's not oily or too heavy. I bought this because I developed a case of Melasma from my last pregnancy. Within 1 week of use twice a day, I've already started to see results. The brown pigment has faded dramatically. This product works amazingly and it's incredibly affordable, running about $5 at Target. I HIGHLY recommend this product! I started using this about 2 months ago as part of my Morning regiment and I haven't seen much of a difference. I saw a slight change but it wasn't much. Didn't meet my expectations at all. I wouldn't buy it again. I got this because I have discoloration on my skin from acne. But when I use it, I can definitely see a big difference in my skin after I rubbed it in. My discoloration is disappearing and I saw results the first time I used it. This is the best fading cream I used and I used a lot throughout my life. I used the entire bottle hoping results would just take time, but after using it every day for months I saw absolutely no change! :( I'm glad it wasn't too expensive, at least, but I'm still very disappointed and still trying to find a product that promises to fade dark spots that actually works! I've used ambi growing up as a child and now as an adult. It's very gentle on my skin and cause no breakout. I will continue to use his product. I have been using it for about 2 weeks and I seen results immediately. Because I constantly pick at my face I'm always getting left with scars, dark spots. It says to use twice a day, I try to, but I'm still seeing results with just once a day. Ultimately love this product. I have been using it for a few weeks and my face has cleared up really quick. I have sensitive skin and have breakouts easily and this product helped clear it up. I would definitely recommended this to others. Where do ya'll buy this? I tried looking for it at Target the other day, but I couldn't find it! My friend uses it and I've noticed her scars have really faded away! I really want some, I just don't know where to find it. Just got this and i smells horrible. I had to wash it off it smelled so bad. I love this product, it really does a good job on my skin, in about a week or so my dark spots and discoloration get better! This has been my life saver! I had very dark almost purple acne scars all along my jaw line and this has completely faded them away!! It took about 6weeks to notice a difference, but it has worked!! This is absolutely the most shocking cream I've ever tried ! It deserves more then 5 stars . I got this and the soap for my daughter , and target the spots that was in most need . She has a caramel skin complexion with real dark knees an elbows . I've only used this for two days so far & twice a day . I must say I am already seeing results , her knees are almost completely fixed :) Check out the photo ! Her knees was all dark , now look at them ! I had acne scars pretty bad my freshman year of high school so I started using AMBI and within a couple a weeks my face started clearing up. I am now a senior in high school and I still use it every night before I go to bed. I still have a few acne scars but not nearly as much as I did before I started using AMBI. It really cleared my face up A LOT. My face is almost completely clear of acne scars and marks and I can thank this product for that. I would highly recommend this. I really like this product. It does what it should do. Within weeks, my dark spots started to clear up. The smell isn't that bad either. I use this on and off but I never notice any crazy dramatic results. It has a terrible smell and is super oily feeling. Worked well but be careful to apply to dark spots only. does not smell good but the scent is tolerable. This works well on dark spots especially well on dark skin. I love using ambi products. their moisturizer is wonderful also. 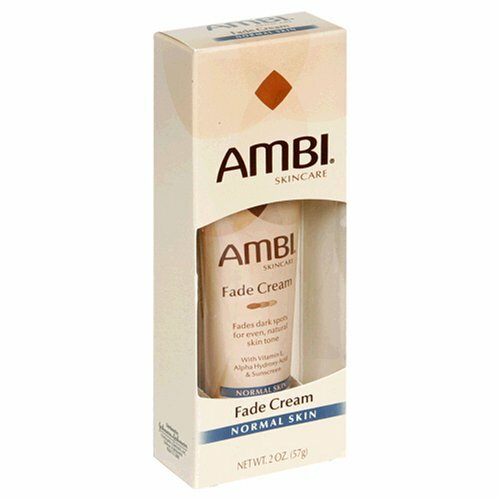 I've used Ambi products over the course of many years. I think the products worked better when I had much younger skin. The products don't work as well on me as some others I've tried even with much dedication. I'm prone to hyper-pigmentation and need much stronger products for results. This formula is specially formulated for Normal skin types.